A week ago, I published this post about my first “spare parts pipe” build, after which I was challenged by Steve Laug of RebornPipes to up the ante and create a pipe using three or more parts from other pipes. Not one to walk away from a thrown gauntlet, I accepted the challenge and started rummaging around in my parts boxes to see what I could find. 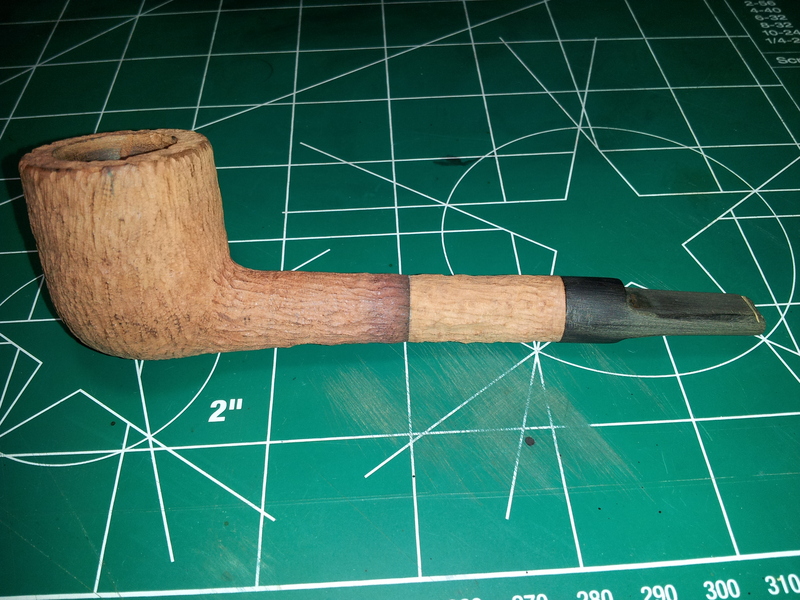 I ended up with a briar bowl in relatively decent shape, another bowl that was both burned out and over-reamed to the point of thinning the chamber walls, and a short taper stem that I thought might work. The bowl I would use to build the Frankenpipe Mark I was stamped “Hickok Deluxe” over “Imported Briar” on the right shank. 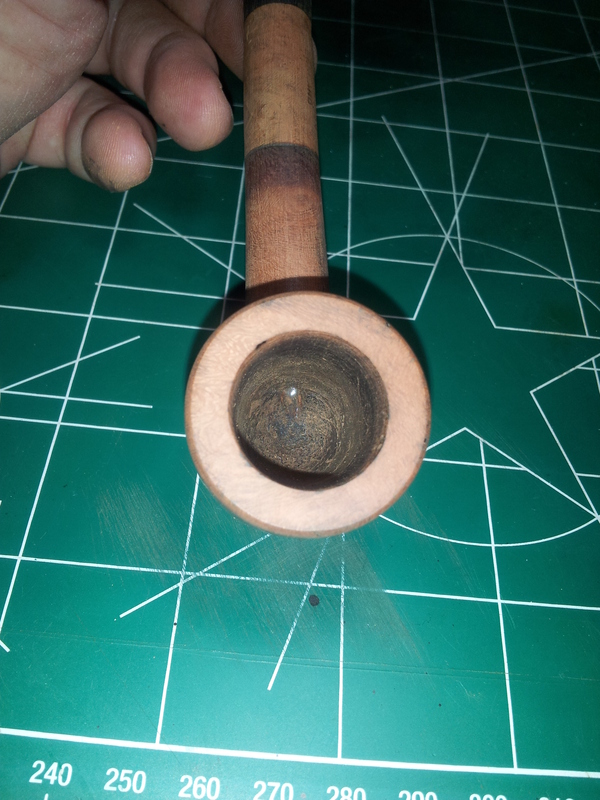 The burnout bowl was a Barling’s Make that had been smoked right through the bottom of the bowl. Here are the parts. 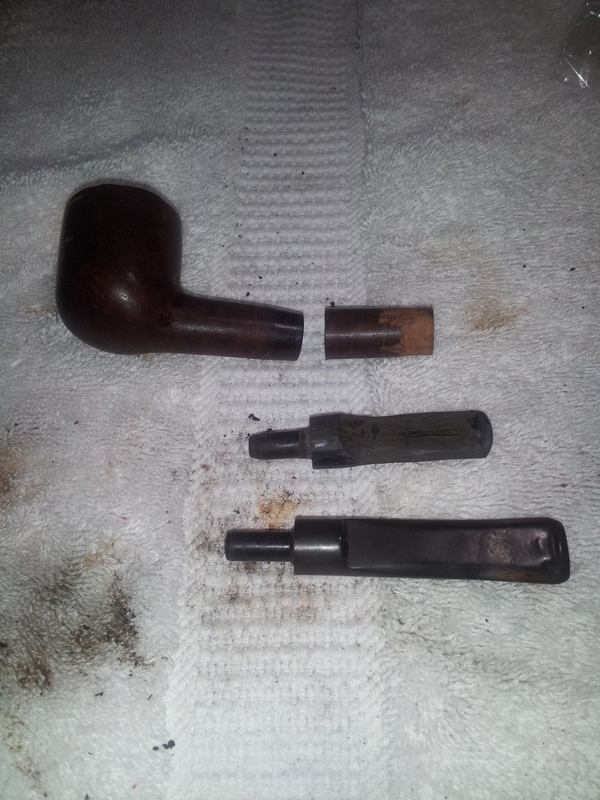 I started by using a Bic lighter to heat the sterling silver band off the shank of the Hickok stummel. I’ll save it in case I need a band somewhere down the road. Then I did a rough fitting of the stem tenon into the mortise of the Barling stummel. The bowl might be shot but the shank would make a fine extension to the Hickok stummel. A quick trip through the mitre saw separated the good shank from the bad bowl. 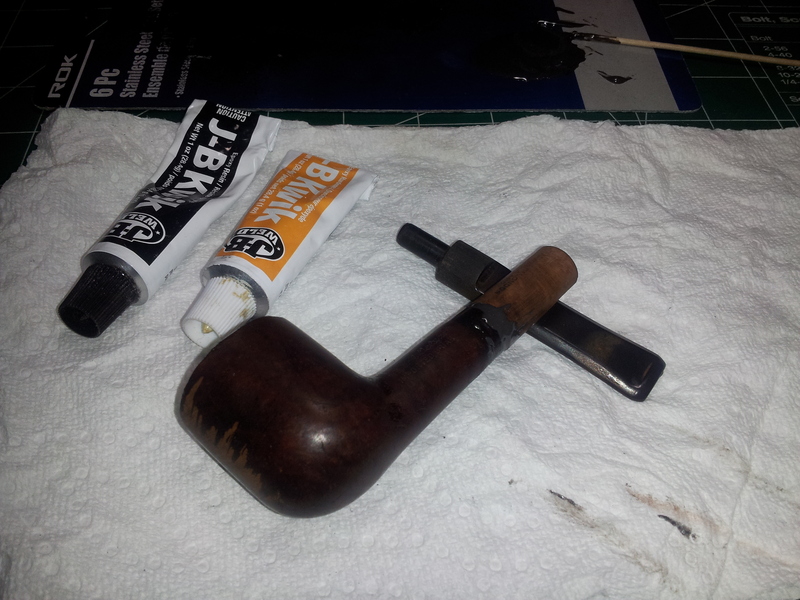 I lay the parts out in line to give an idea of what the finished pipe might look like, then wiped the briar parts down with acetone to remove the old finish in preparation for assembly work. I used my rotary tool with a sanding drum attachment to thin down the diameter of the short taper stem to match that of the shank extension. This went well, until I decided to get cocky and attempt to reshape the taper stem into a saddle stem. Things were proceeding according to plan until I lost concentration for a moment and sanded right into the stem’s airway. Doh! Luckily, a quick search through the stem box turned up another likely candidate – a saddle stem, this time, but longer than the original short taper stem. I’d have my work cut out for me retrofitting this one. The tenon on the new stem was slightly small, so I expanded it by heating it over a flame until malleable, then inserting the smooth end of a drill bit into the airway. The bit was slightly larger than the original airway, but the tenon, soft from the heat, stretched that fraction of an inch to accept the drill bit. A quick cool-down with cold water set the tenon in its new larger diameter. My next challenge was to splice in the shank extension while maintaining both the overall structural strengthen of the pipe and a smooth-flowing airway from bowl to button. A trip to my local hobby shop provided the answer – an inexpensive 12” length of 3/16” (outer diameter) brass tubing. The interior diameter was 5/32” – my preferred size for airways. Sweet. The drill bit in the pic above is 3/16”. I used it to drill small mortises in both the airway of the stummel, near the bowl, and the end of the shank extension. This gave me snug pockets into which the ends of the brass tubing would fit. To prep the tubing for glue, I cut a length to size and roughed up the entire piece with 220-grit sandpaper before using a triangular needle file to cut 3-4 notches around the circumference of the tubing at each end. Now the epoxy will have something to grip. I used JB-KwikWeld epoxy to assemble the new longer stummel. I mixed up a small batch of epoxy, and applied some to one end of the brass tubing and slid it home into its drilled pocket in the Hickok shank. I ran some more epoxy down into the old stem mortise to keep the tubing centred in the airway, then glued the other end of the tubing into the Barling shank extension. I smoothed out the squeeze-out from between the pieces of briar, and held the assembly in position for a few minutes until the KwikWeld set up. Then I set the new stummel aside to cure overnight. The next day I started sanding and shaping the newly extended shank. 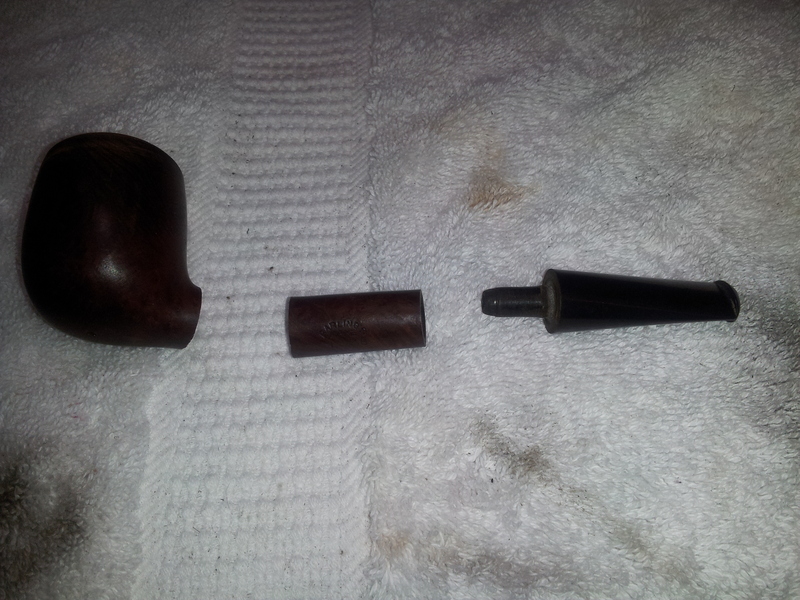 The Hickok half of the shank was larger around than the Barling half, so I worked to smooth out the flow fo the shank from bowl to stem. I also topped the bowl to get rid of the dents and dings there. 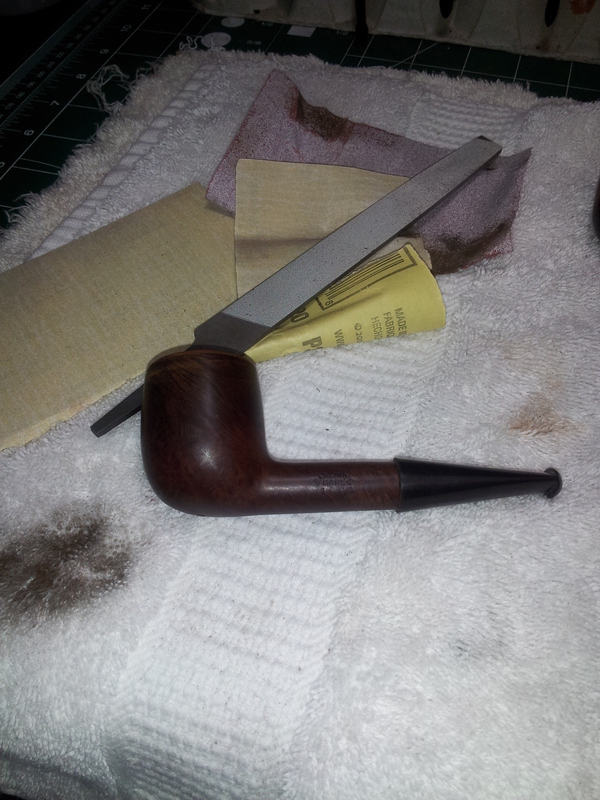 The next task was rustication, which is capable of hiding a myriad of sins, and I didn’t want the stitches showing on this Frankenpipe. 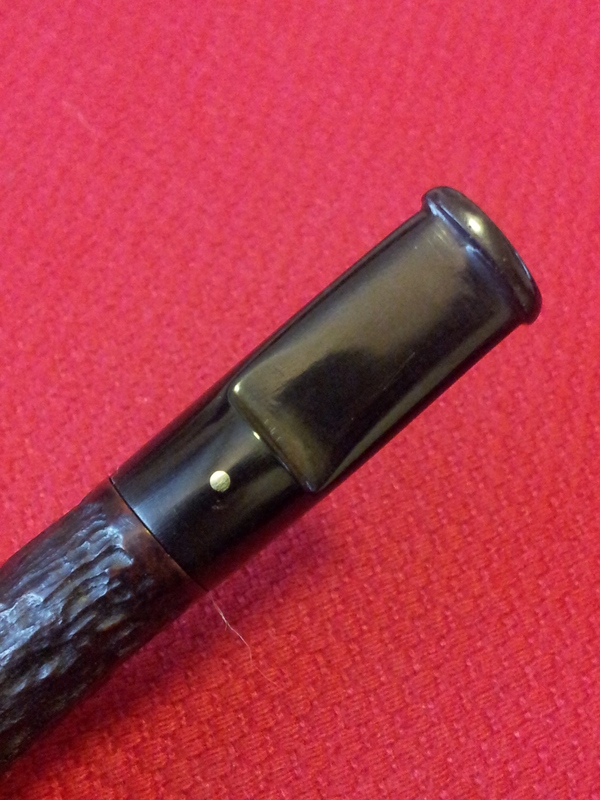 The rustication removed most of the epoxy left on the surface of the shank after sanding. The rest could be disguised under a good finishing stain. I also took the opportunity to cut off the overly long saddle stem using the rotary tool and a cut-off wheel. It’s starting to look like a decent Lovat now. Of course the cut-off stem couldn’t be left as it was. 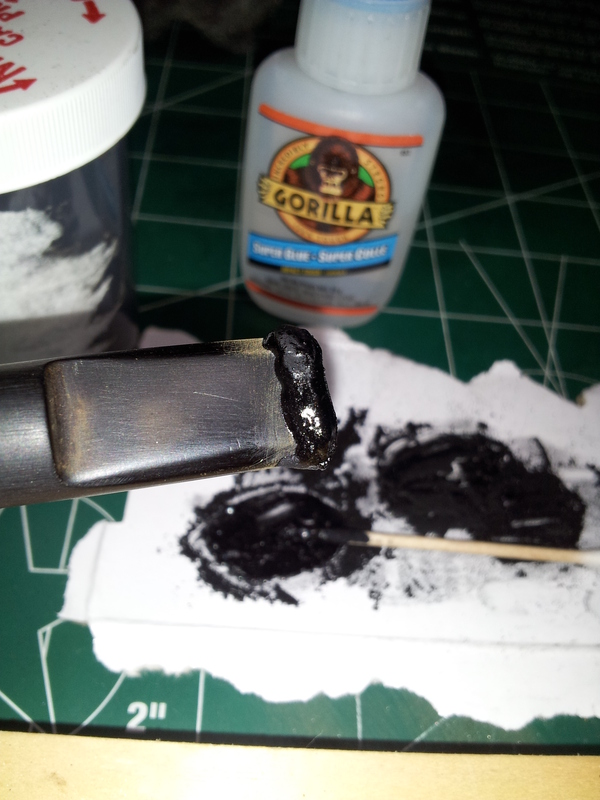 It needed a button, so I mixed CA glue and charcoal powder into a thick paste and layered it onto the end of the raw stem. When it cured, I used a variety of files and sandpaper to shape and smooth the new button. 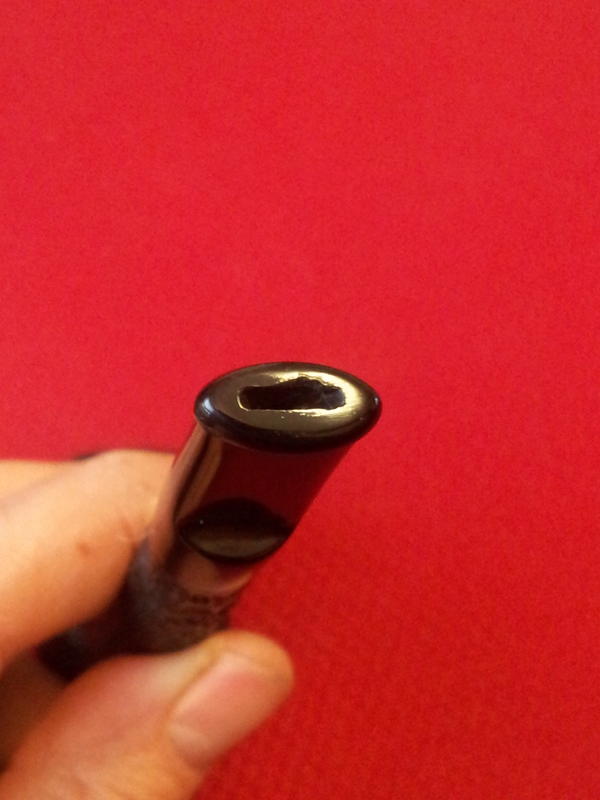 I also cut the slot at the end of the airway. For this I mounted a small carving burr in my drill press and guided the stem by hand to route out the slot. It’s not perfect, but not bad for a first attempt. 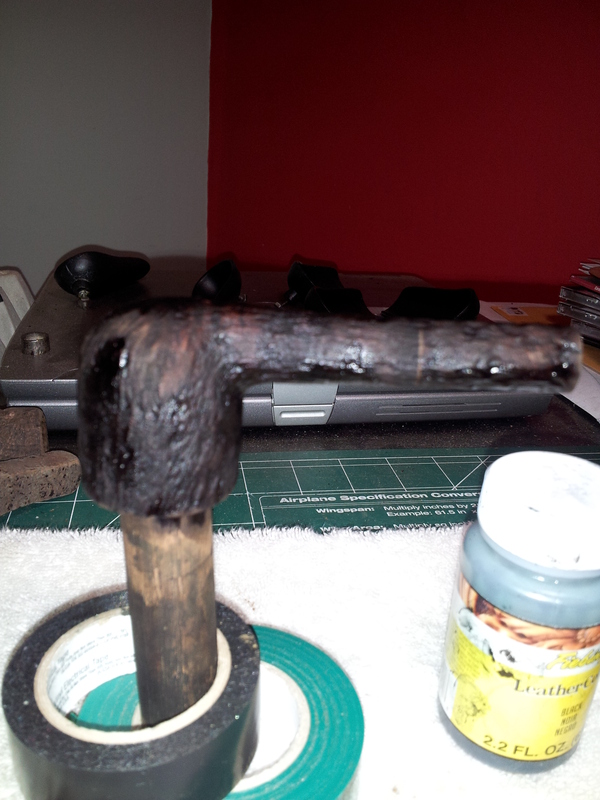 While the CA & charcoal button cured, I stained the stummel. I first applied two coats of a reddish-brown stain mixed from Fiebing’s water-based Dark Brown and Saddle Tan leather dyes. I let each coat dry, and then buffed off the excess by hand with an old terry towel. This was followed by a darker stain made with a 3:1 blend of Dark Brown and Black dyes. I paid special attention to make sure the lighter briar of the shank extension came out the same shade as the darker original shank. The line of the epoxy joint in the shank shone through the stain in a few places, so I touched up the joint using my darkest stain marker and a black Sharpie. 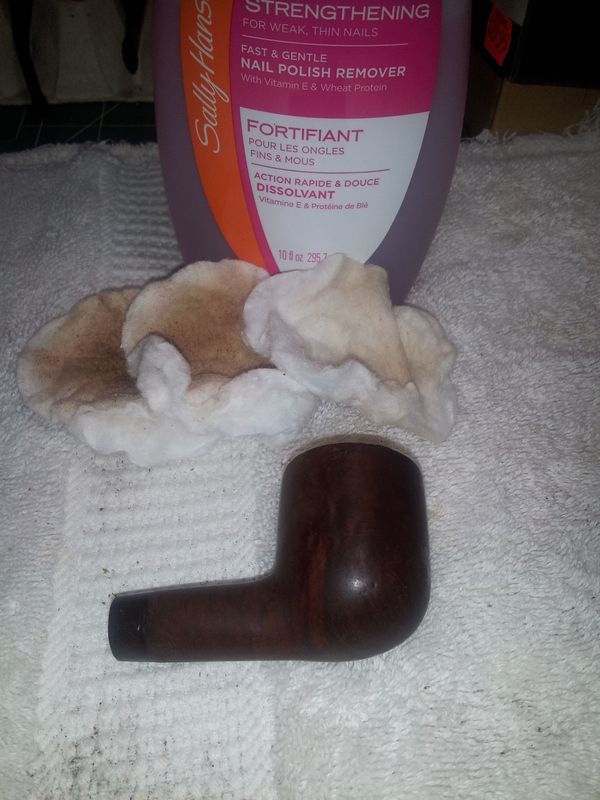 When the stain had dried completely, I wiped the stummel with mineral oil to give the wood some life and moisture. I liked the overall look of the new pipe, but thought it could use a bit of bling to spruce it up. 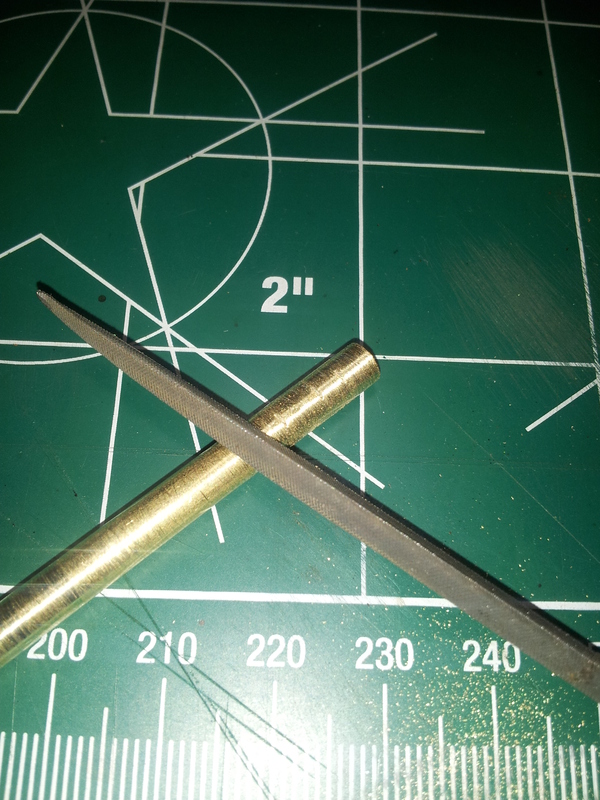 While I was at the hobby shop for the brass tubing, I had also come across 1.5mm brass rod and a set of 8 precision drill bits in 1.05 through 2mm sizes, Score! And that’s how this stem got it’s brass dot. 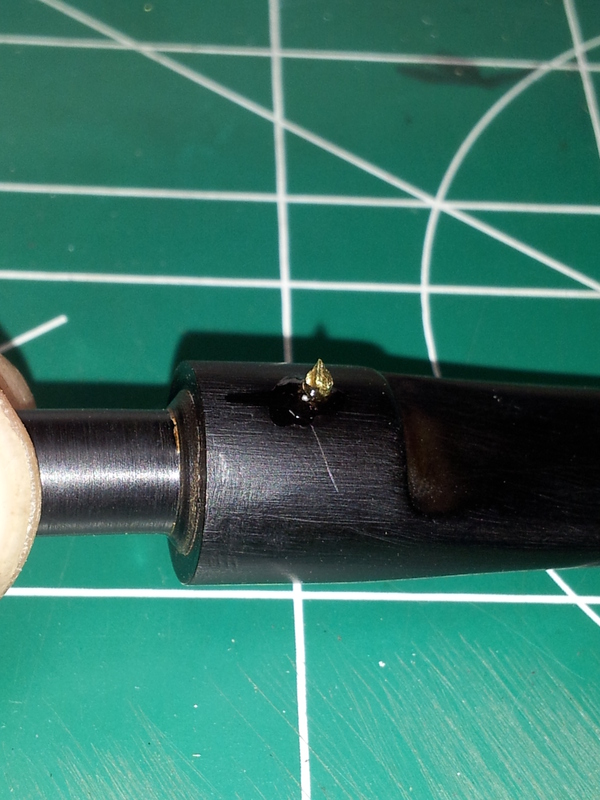 I carefully drilled a hole in the top of the stem and dripped a tiny amount of CA glue into the hole before inserting a small piece of brass rod. 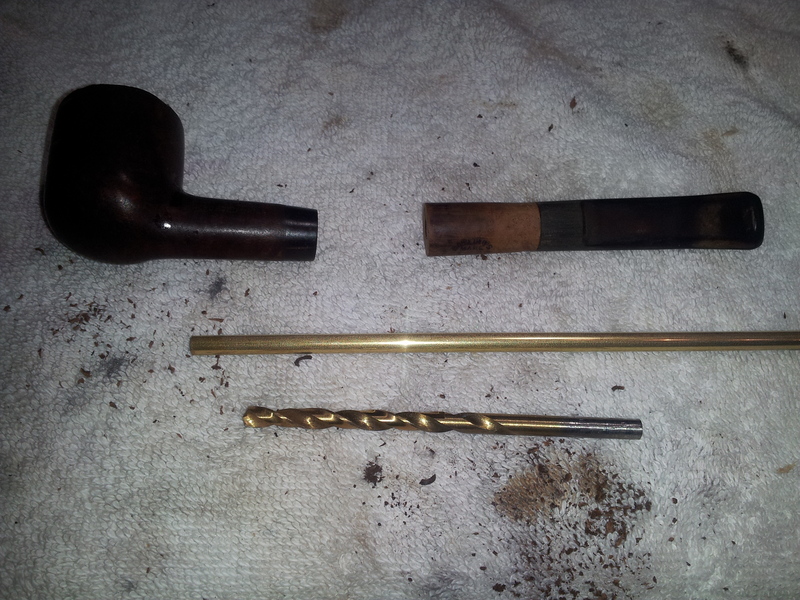 I let the glue cure, then filed and sanded the brass rod flush with the vulcanite. 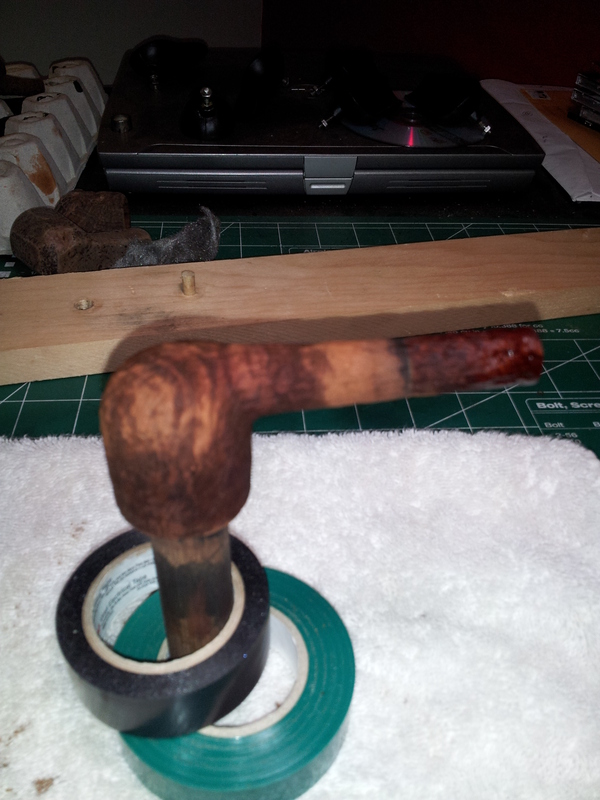 Then the stem was wet-sanded with 600-2000 grit papers to smooth things out. Finally it was time to polish everything up. 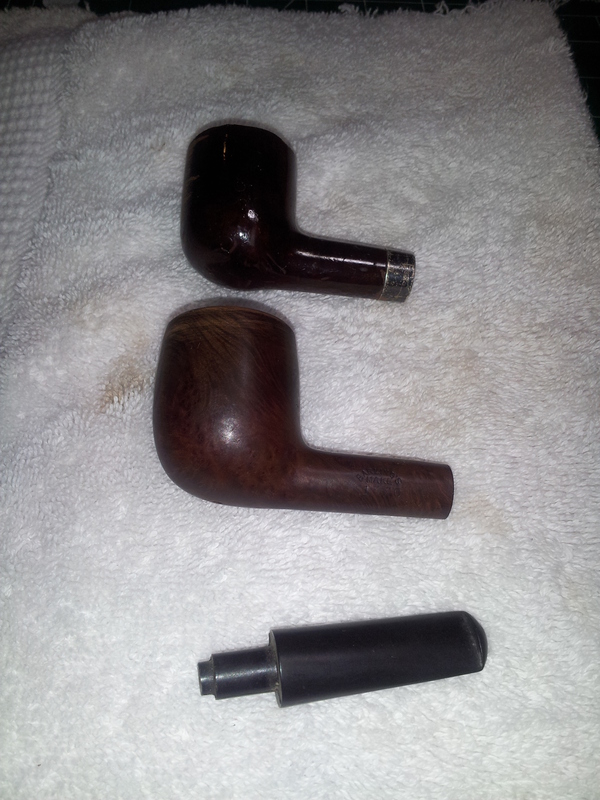 I buffed the entire pipe with White Diamond compound on the wheel and then applied multiple coats of Carnauba wax. 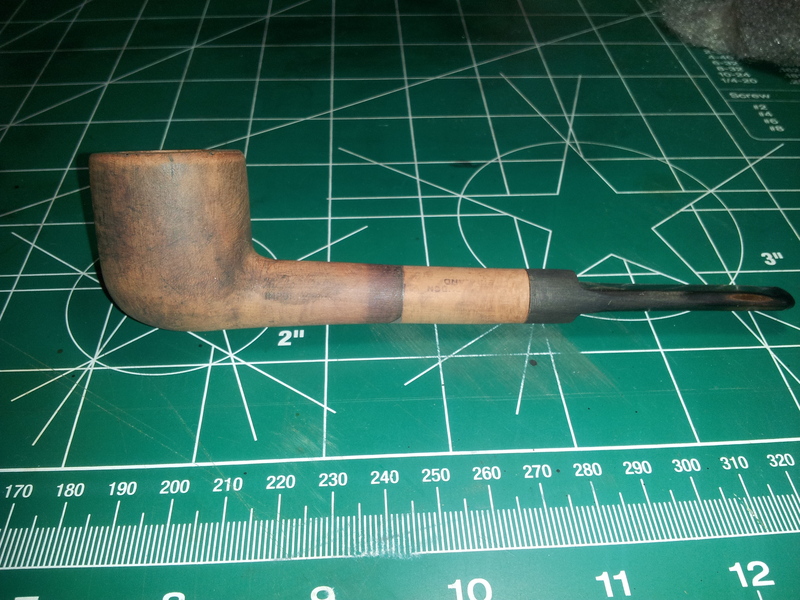 I’m happy with the end result – I learned a lot during this build, including when NOT to do something – and the Frankenpipe Mark I turned out to be a pretty sharp-looking Lovat. 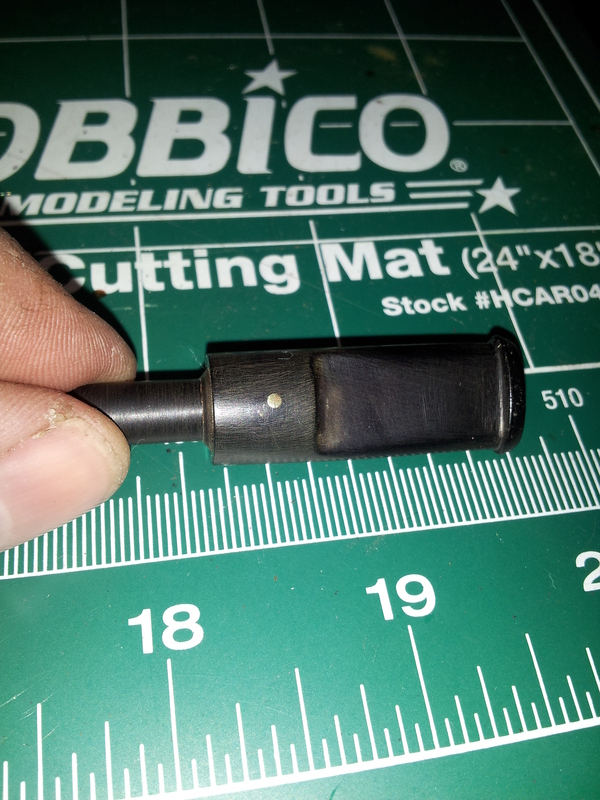 It’s just shy of 5.25” long, with a bowl 1.5” high and 1.25” across and a bore of 13/16”. 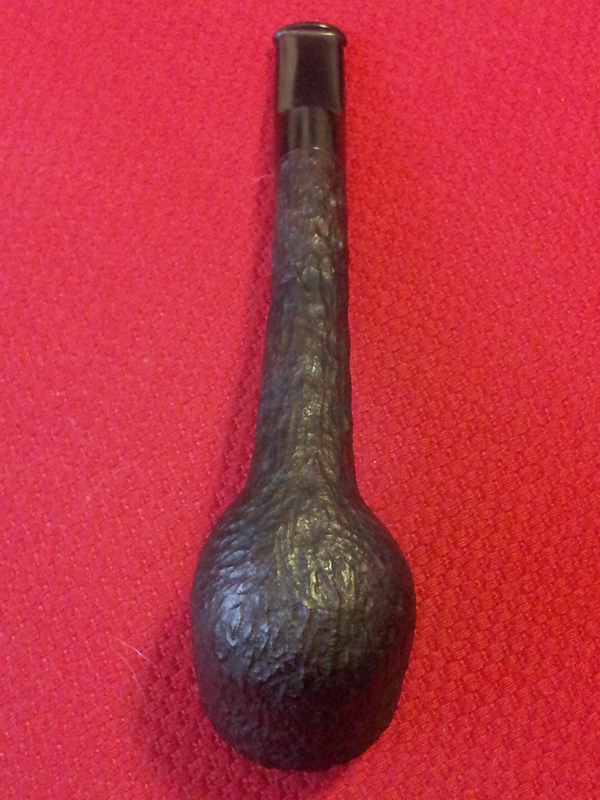 In fact, except for the weight (the entire pipe comes in at a feather-light 29 grams) and about 1/2” in missing length, this pipe is proportionally identical to a Savinelli Punto Oro Mister G in my collection. I have yet to smoke a first bowl in it, but if the open draw and comfortable bit are any indication, it should be a good smoker. 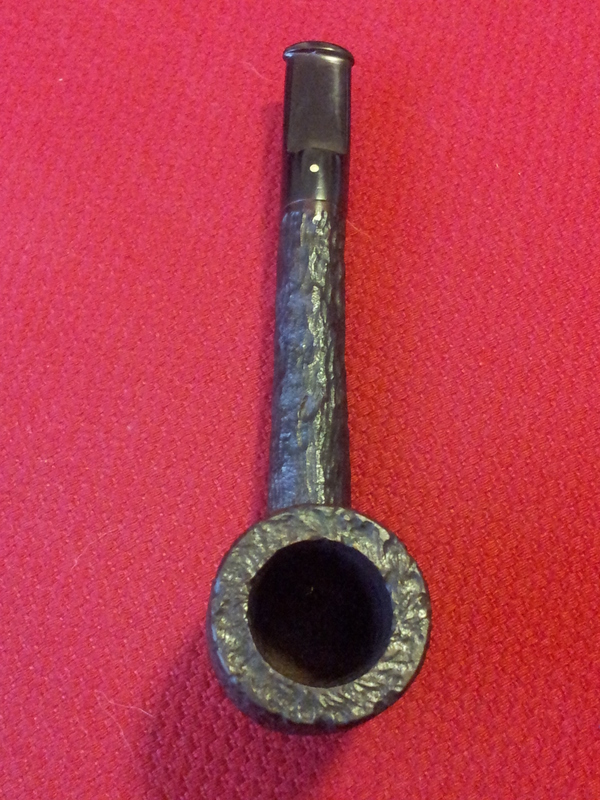 Here’s the finished pipe. Thanks for looking. Very creative and a great result in my opinion! I’ve long thought about doing the brass-dot and now I REALLY want to try it after seeing how nice it looks! Great post. Thanks, Greg! 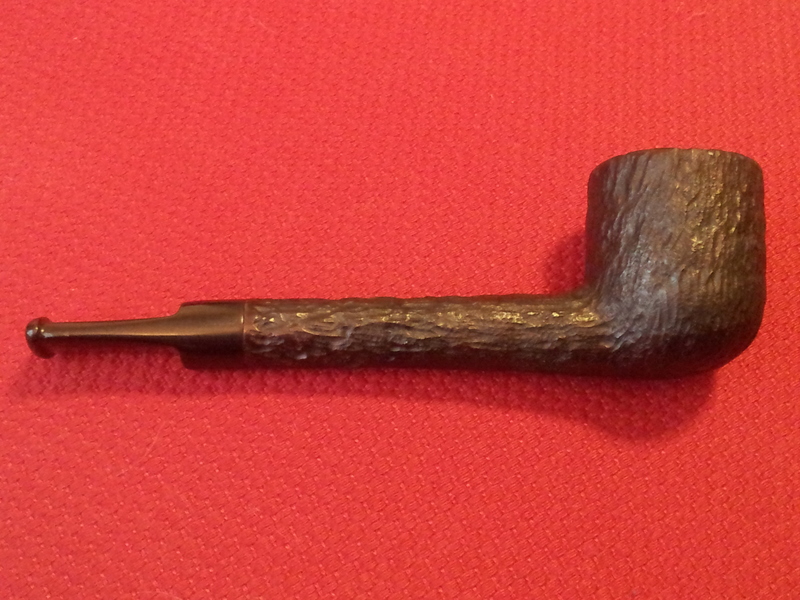 I had a great time building this one, and I wanted another Lovat in the rack anyway. I’m already looking for components for a Mark II ;-). 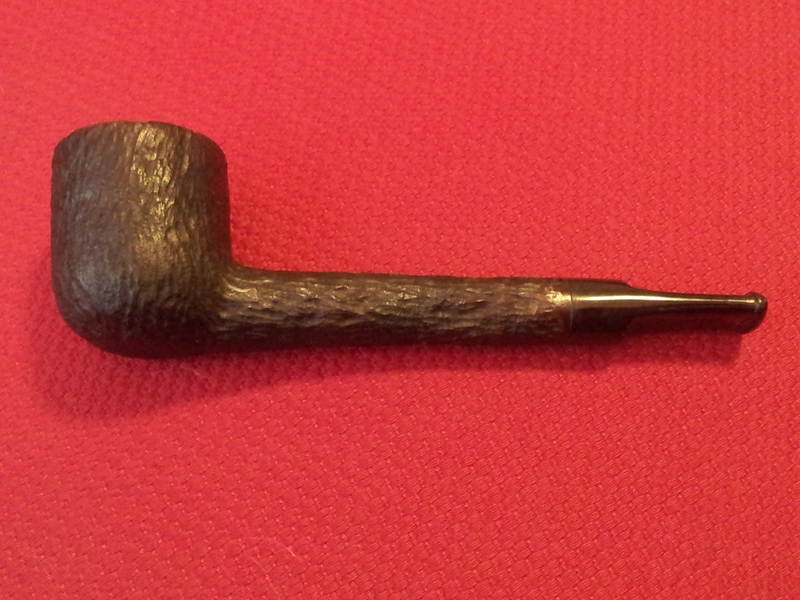 I wanted to experiment with the dot inlay as I’ve got a 3-dot Brigham waiting for a new stem. Now I know I can do it, so that project can move forward. Wow, what a transformation! Dr. Frankenstein would be proud. Haha. There’s everything to like about that pipe. Just a super job. I like the brass dot too. You rose to the challenge and nailed it to my eye. Very nicely done. I love the looks of the finished pipe. The brass dot is nice finishing touch. Well done. Agreed. I hope every restorer tries it at least once. A great chance to try new techniques, solve problems and be creative! Thanks for taking up Steve’s challenge, and sharing the project with us. Your results are outstanding. I love the ingenuity! Somewhere, I read a pipemaker commenting on why not to use brass rod as a joint, but i don’t remember where. I love the stem logo! Thanks Al. I debated brass vs aluminum & went brass for structural strength. I’d love to know if thete are reasons to avoid brass. I know aluminum is very common for tenons, stingers etc. I’d assumed it is the go-to metal for pipes because it is lightweight & durable.